We are originally from New England so it pretty much goes without saying that we love football. It's not just our team though, we watch any game that affects our team, or sometimes a friend's team. We've been to a bunch of games and will pretty much go to any football game at any level of play because it's just downright exciting. We live in an insane time where the rules are as unrestricted as they will ever be, and I feel like we need to enjoy the game for what it is before people come to their senses and change it. In 30 years, it's my prediction that football as we know it will be a completely watered down shadow of what it once was, but at least we have these glory days to enjoy it as it currently stands. 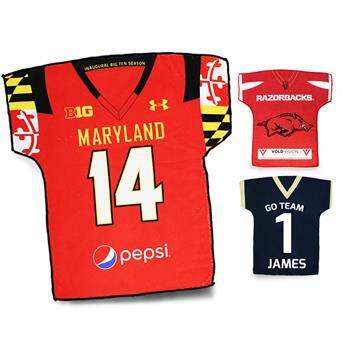 We sell a ton of different football related items, but these football jersey rally towels are some of the coolest because of how they look when they are customized with your team logo or mascot. Price includes full front imprint in up to 3 colors. If you only need one color print on a white background, contact us because we can knock some $$ of the price. These take 4 weeks to make plus shipping, so order early. If you have a REAL lot of time and can give us 10 weeks to make these plus shipping, contact us for a much lower price.